Brand new home with new furnishings. Master suite with king sized bed, 32' LED tv, oversized shower for two, sliding doors to large deck with teak lounge chairs, palm trees and a Sundance hot tub (great therapy jets!). All this is completely private on the second floor! Guest room with queen sized bed, 32' LED tv, also has sliding glass doors to the deck. 3rd bedroom is set up as an office with fax, wireless internet, double bed and a pull out single sofa. Washer and dryer conveniently located upstairs. Kitchen open to living room and dining room - all with views of resort-style heated pool with waterfall. An entertainer's delight! 550 sq ft covered patio (shade is nice here in sunny Florida) with ceiling fans, cushioned wicker chairs, gas BBQ, new Weber Platinium Premium charcoal grill/smoker with rotisserie and picnic table for casual outdoor dining. Fenced in and gated backyard surrounded by large palm trees means that bathing suits are optional! No neighbours can see you on the second floor deck with hot tub either! Wonderful privacy! Outdoor hot shower. Let me be your concierge! : If you have any special interests - boat rental, segway tours, watching live sporting events, summer day camps for kids and other kid activities, even buying a boat or an RV to send to Europe, I can help! Just let me know what you want to do and I can email you information before you get here. Sailfish, Sharks, Wahoo, King fish, Swordfish, etc.. Number of guests: This house is the perfect size for two couples - one couple in each of the bedrooms - plus one child in the third bedroom. The living room sofa does pull out to to make a double bed but the house is most comfortable sleeping 6 people. There's a top of the line gym quality Sole e95 elliptical machine in the house so you won't miss out on your workout routine! I moved to Fort Lauderdale 15 years ago. I grew up on the Chesapeake Bay in Maryland but found that Florida's tropical climate suited me. I have travelled the world spending over a year in Thailand learning the language, studied for a semester in Perth, Australia, visited South Africa for a few months, worked on a 210 foot private yacht in the Caribbean and have backpacked all over Europe. I studied French for a few years and I understand a tiny bit of Spanish. Don't worry if you don't speak English very well. I am used to communicating with people who speak little English! I designed and built this house as an owner/builder which means I acted as the general contractor. I studied other homes and wanted to create something special. Nobody else has a hot tub on their second floor deck. It's important to have a shady area near the pool since you can't spend all your time in the sun. I designed the electric heated marble pool with a 6 foot wide waterfall and an umbrella so it would give the house a resort feeling. My pool is nicer than the pools you would find in most $2 million homes! Everybody wants privacy. I planted the areca palm and oleander trees myself back in 2006. They give the backyard complete privacy so you can use the heated outdoor shower anytime and bathing suits are optional. Even the hot tub is completely private except for the moon and the stars! Two full bathrooms and one half bathroom near living room. Most people use the heated pool shower outside since it's so nice to shower in the sunlight - or the moonlight! Telephone included with Vonage - most international calls are free! FAST internet suitable for streaming video or gaming. Bath towels, pool towels too. Open wireless internet with 25 meg per second - fast! Full dishes, glasses, pots, pans, everything you need to cook gourmet meals! Full dining room plus seating for three at the kitchen island. Full sized picnic table on the patio for outdoor dining. Second floor balcony with hot tub and lounge chairs right off the bedrooms. Always sunny and completely private - nobody can see you there. There are usually one or two bicycles that guests are welcome to use. Very large shaded patio next to the pool with wicker furniture and bbq grill. Picnic table too. Tennis courts less than a mile away. Marble pool with waterfall - looks like a resort hotel pool! Electric pool heat to 80 degrees included with rental. Hot and cold water shower next to the pool. 6 person Sundance hot tub with great jets! Washer and dryer conveniently located upstairs near the bedrooms. There is a hot and cold outdoor shower next to the pool which is private - the neighbours can't see it! Great for rinsing off after a swim or you can take all your showers out in the Florida sunshine! No smoking inside the house. Smoking allowed on deck outside bedrooms and covered patio off living room. Kitchen has two sinks and a wine cooler. Fridge has chilled filtered water and ice machine in freezer door. The house has a portable crib, high chair and stroller. I have never rented to anyone with a dog or cat. I would consider a longer term rental to someone with pets but there would be an additional charge to cover steam cleaning everything. We had a fabulous two weeks walking around Wilton Manors. Restaurants and shops were 15 minute walks away. The Atlantic beaches were only 20 minutes drive when we felt like going, but the pool was the place to be! The house was great, clean, and everything worked fine. Beautiful weather, confortable house, warm bath and pool! 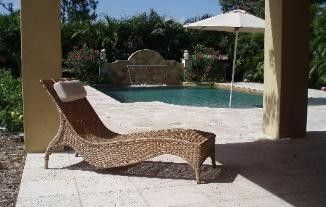 House was great, very private, clean and well maintained, great pool, exactly as advertised. Close to downtown Fort Lauderdale, 15 minutes to Las Olas Blvd. The homeowner could not have done anything more for us. Definitely recommend to friends and relatives. This was our second year. Although not on the beach we are only a ten minute drive away and the truth is we enjoyed the pool so much we never missed a swim in the ocean. We did go for walks on the beach and that was enough. The house is lovely and we felt like it was our home away from home. We had friends join us last year for a week and they were very happy to know that we were inviting them to be there again. We found Boyd always accessible if we had a question about anything at the house. He could not have been any more than accommodating. When we about to stay in a hotel one night before we headed home we were invited to stay in the spare room of the house. We thoroughly enjoyed our stay. Thank you Boyd. We booked this home with only a week's notice after being unceremoniously dropped from a booking we had elsewhere in the region. From the first point of contact the owner, Boyd, could not have been more helpful. He gave us many tips on the area, and answered any questions we had immediately. There was also a tip sheet waiting for us in the house on our arrival, and we followed many of them. The house is as seen in the photos, only better. The pool has many levels to it, which kept our kids entertained all week. The garden is completely private. The TV has cable, which meant even us Brits could find something decent to watch! And the kitchen has everything you could need for your holiday. The location offers easy access to I-95, but is around 15 minutes to Las Olas and central Ft Lauderdale. There are plenty of nearby convenience stores and coffee shops, and a host of restaurants less than 10 minutes drive away. The area also plenty of routes for the joggers that dont want to parade up and down the ocean front. We would highly recommend taking a segway tour down at Birch State Park, and Miami Beach is close enough to be a must. Outside of that enjoy the pool and chill out. We are delighted we stayed at Boyd's place, and would highly recommend it to anyone visiting the Ft Lauderdale area. Highly recommended house with good facilitaties where the pictures do not quite do it justice. We had a lovely stay in Ft.L, property was as described, well maintained with everything you needed. Boyd is a great owner, excellent communication, he went out of his way before we arrived answering all our queries & checking out a number of restaurants for us so that our stay was perfect. Many Thanks & will recommend to anyone looking for a holiday home in that area of Ft.L. The house is in Wilton Manors (part of Fort Lauderdale) and is 15 minutes walking distance from the shops and restaurants of Wilton Manors on Wilton Drive. 5 miles from Downtown Fort Lauderdale. 3 miles from the beach. Just east of I-95 located near Andrews Avenue between Oakland Park Boulevard and Sunrise Boulevard (two main exits of I-95). Fort Lauderdale is one of the world's premier sport fishing destinations. Sailfish, Swordfish, Snapper, Tuna, etc. Charter your own boat with captain for a half day or full day. The scuba diving here is great with lots of wrecks to dive and fishes to see. Plenty of sightseeing boats, snorkelling boats - even a water taxi which runs along the inter-coastal canal next to some incredible waterfront mansions. Golf, sailing, and tours of the Everglades National Park are other activities to keep you busy on your vacation! Great food, world famous beaches, fantastic night-life, the list goes on and on. Tourists and locals love being in Fort Lauderdale. You will too! Other Activities: Ocean, beach, sunshine, night-life - Fort Lauderdale has everything but snow skiing! Weekly cleaning on rentals over 2 weeks Security Deposit: $1500 will be sent within 2 weeks of checout Security deposit can be charged to a credit card via Paypal and can be returned with no fees charged. Very convenient! Renter pays 3-4% additional credit card fee if credit card is used. Many equerries request a discount or a last minute rate. There are no discounts for stays of less than a month You will NOT pay the "Homeaway Service Fee" which seems to be $175 for one week. All payments go directly to myself, the homeowner. I've been doing this for about 9 years and I don't see any benefit of this fee.